Power and privilege in this and many other countries is rich, white, male, straight, and able-bodied. The fewer of those identities we can claim the more marginalised we become. I have spent my writing life centering and making visible the Other, showing that we exist and that we matter. Stories make culture. If we want to be visible in this culture we must make our voices heard. 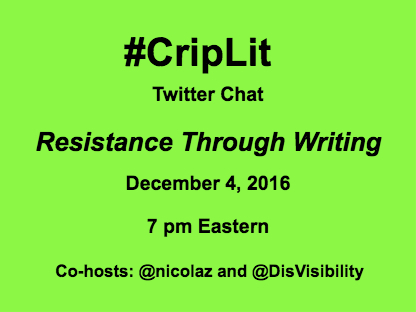 Co-partners of #CripLit, novelist Nicola Griffith and Disability Visibility Project’s Alice Wong, are proud to host the fourth #CripLit Twitter chat for disabled writers. All disabled writers are welcome to participate in the chat including reporters, essayists, poets, cartoonists, bloggers, freelancers, unpublished or published. We want to hear from all of you! Check the #CripLit hashtag on Twitter for announcements of future chats that will focus on different genres or topics. Use the hashtag #CripLit when you tweet. If you only want to respond to the questions, check @DisVisibility’s timeline during the chat. The questions will be timed several minutes apart. Welcome to our 4th #CripLit chat. We had planned a chat with disabled editors but the recent US election has made this topic more urgent. Nicola Griffith is a British novelist, now dual US/UK citizen. In Yorkshire, England, she earned her beer money teaching women’s self-defence, fronting a band, and arm-wrestling in bars, before discovering writing and moving to the US. She was diagnosed with MS the same month her first novel Ammonite was published. Her other novels are Slow River, The Blue Place, Stay, Always and Hild. Her essays and short fiction have appeared in an assortment of academic texts and a variety of journals, including Nature, New Scientist, Los Angeles Review of Books and Out. Among other honours her work has won the Washington State Book Award, the Tiptree, Nebula, and World Fantasy Awards, the Premio Italia, and six Lambda Literary Awards. She is married to writer Kelley Eskridge and lives in Seattle where she emerges occasionally from work on her seventh novel to drink just the right amount of beer and take enormous delight in everything. Alice Wong is a San Francisco-based disability advocate, freelance journalist, television watcher, cat lover, and coffee drinker. Alice is the Founder and Project Coordinator for the Disability Visibility Project (DVP), a community partnership with StoryCorps and an online community dedicated to recording, amplifying, and sharing disability stories and culture. Currently she is a co-partner with Andrew Pulrang and Gregg Beratan for #CripTheVote, a non-partisan online campaign encouraging the political participation of people with disabilities.